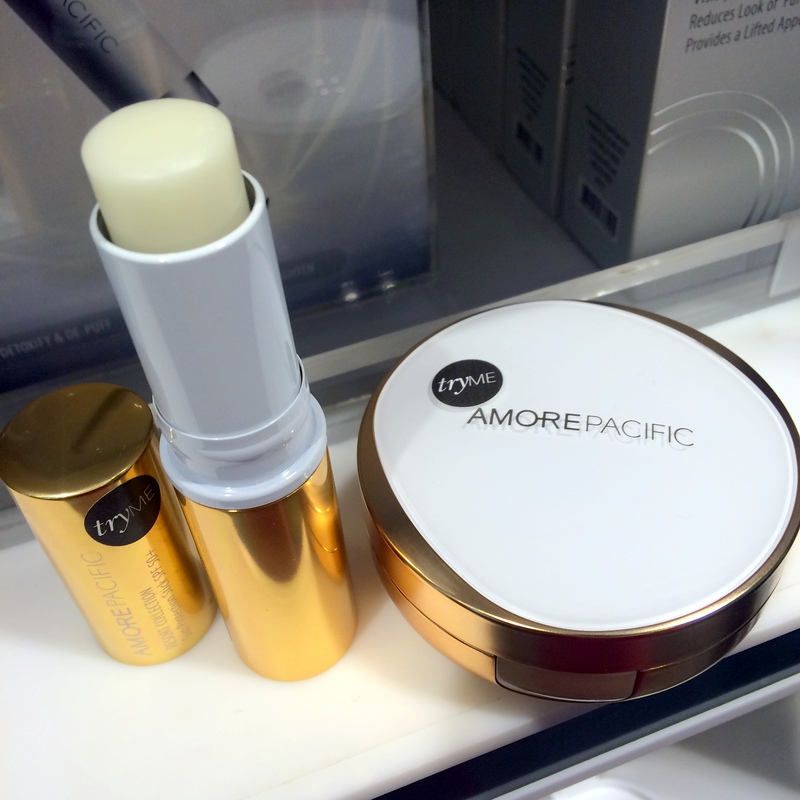 For the summer, AmorePacific came out with a Resort Collection comprised of sunscreen products. 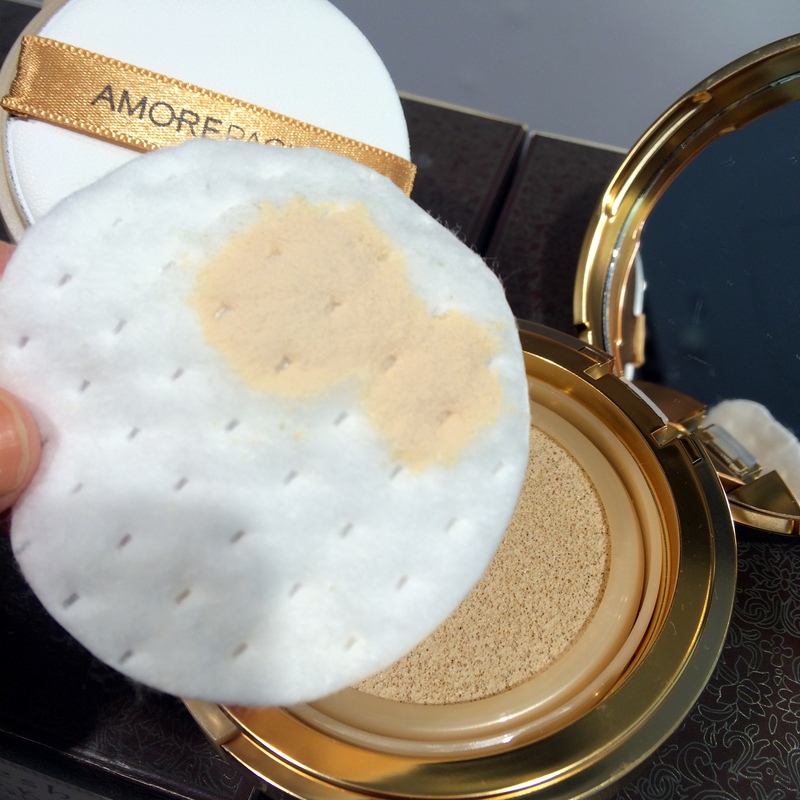 I came across the Resort Collection Sun Protection Cushion SPF30+ ($40 for 0.52 oz.) and the Resort Collection Sun Protection Stick SPF 50+ ($40 for 0.24 oz.) at Sephora and couldn’t resist testing them out because they were unused testers! For a beauty addict enthusiast, that’s like stumbling across a winning lottery ticket. 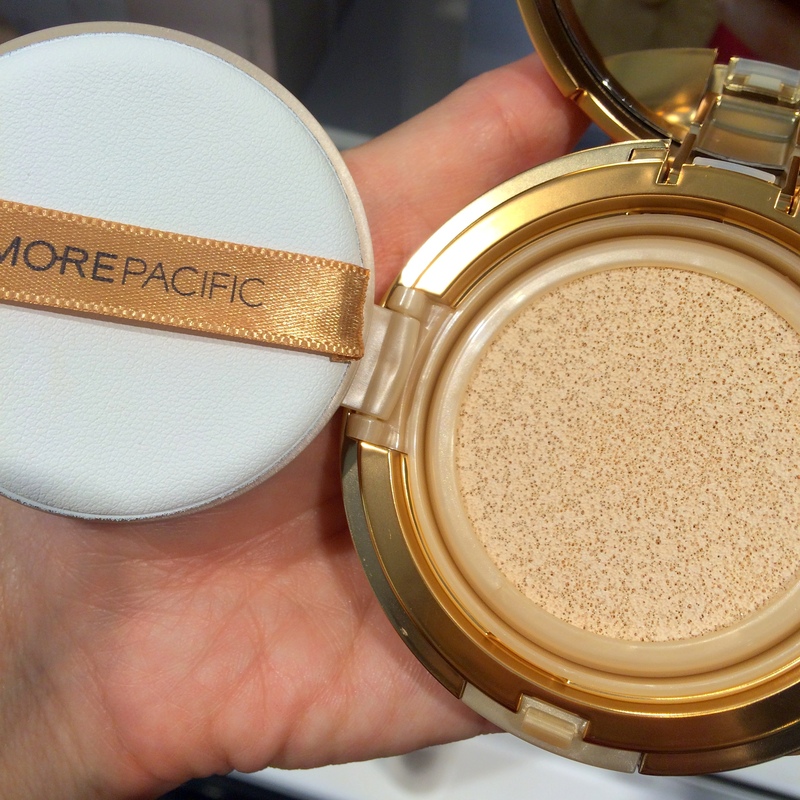 Check out the glam gold and white packaging. Ultimately I decided against buying them for reasons I’ll explain below, so these are purely my initial impressions from trying them in the store. The Sun Protection Stick offers SPF 50+ in the form of chemical sunscreens. The stick is firm but applies lightly and smoothly (doesn’t drag) without leaving a sheen or waxy residue. I’m just not a huge user of sunscreen sticks though. This stick might be worth the splurge for someone in need of an elegantly formulated way to apply (and reapply) sunscreen on the ears and nose. The Sun Protection Cushion offers only SPF 30+ using a mix of physical and chemical sunscreens. The “resort” theme extends to the inside of the compact, with a bright white, faux-leather-textured Rubycell puff with gold strap. Typical of AmorePacific products, it’s a “waterless” formula, using bamboo sap instead of water as the top ingredient. The formula has a slight tint, but it’s intended to be sheer and colorless; the tint is likely added to minimize any white cast from the physical sunscreens. 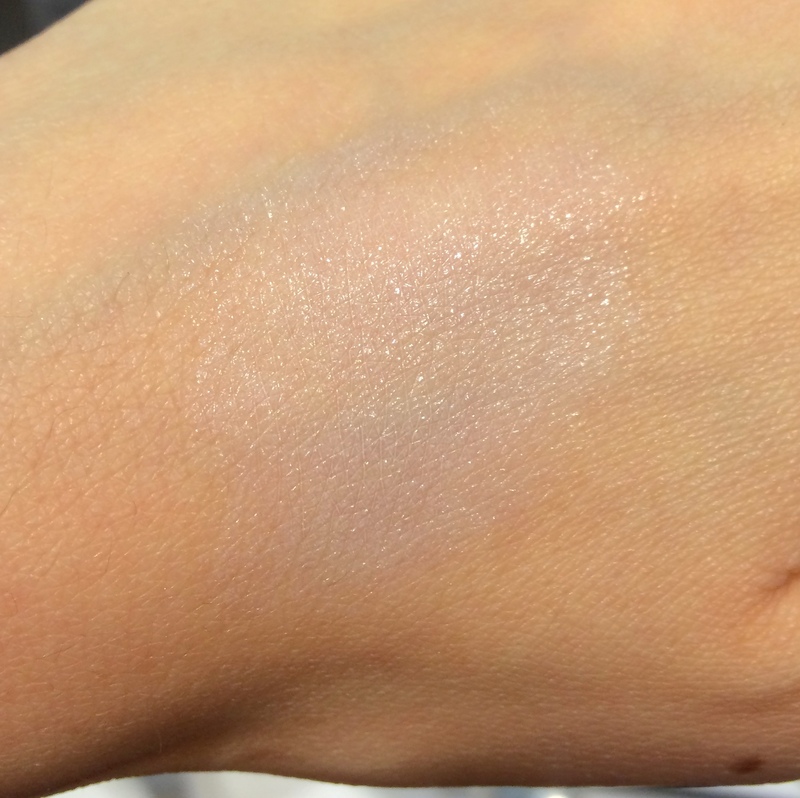 I tested it on the back of my hand, which is currently MAC NC20 or 25. Unfortunately, it applies with a white tint and even as I patted and spread the formula across the back of my hand with the Rubycell puff, the white tint persisted. My hand was left with a slight moisturized sheen and definitely looked brighter (read: slight white cast) than before. Thus, I have my doubts that this would apply truly colorless on medium or deeper skin tones–especially if one tries to apply enough to get anywhere near the advertised SPF level. Not yet blended out, but the result after blending wasn’t too far off from this. Since the SPF level of this cushion is relatively low (30+ versus the 50+ that many other cushions routinely offer) and I don’t see when I would realistically want to apply a cushion without coverage, I passed on this as well. Right?! I suppose one could use this cushion and then apply foundation on top…but then why not just use a properly colored cushion to begin with. O wait. Since when is AP at Sephora though?! AP has been there for two or three years now. You’ve been missing out! The AP cushion was my first and I bought it at Sephora two years ago.